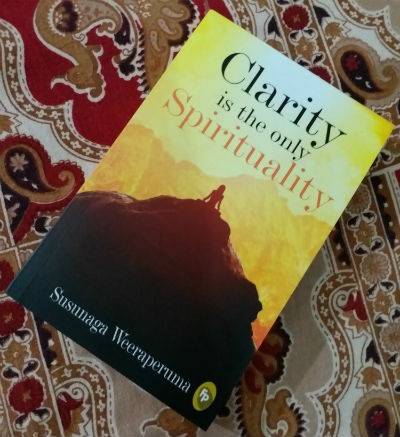 Recently we came across a book named Clarity is the only Spirituality by Susunaga Weeraperuma and we decided to read it. Fortunately, from our team, I got a chance to read it and I am happy for that. So, here are my genuine and unbiased views for this book. It is not a linear story like the majority of the books explore, it is rather a collection of some of the speeches and motivational lectures delivered by Susunaga Weeraperuma along with some of the articles he wrote. It is an unconventional book in that terms and can be considered as a motivational book. Stepping Stones by Lubhna Dongre. Of course, both the books have many differences being the age difference and real-life experiences of both the authors. And, this book talks more about spirituality and thus the references to the religious stuff are inevitable. The author’s main aim is not to talk about religions or to be precise which religion is to be followed, he rather suggests that clarity in the thoughts and vision is a prime requirement to taking steps in the spiritual world. The way he refers many religious scriptures and talks bluntly about the stuff in a realistic manner is quite courageous. His thoughts are very clear and he doesn’t speak in favour or against any religion but talks about the various attributes and practises and his views about the same. The author has spent a lot of time travelling various countries and exploring various cultures and his writing reflects it. As the author is settled down in France now, it is obvious to have references to the culture of France as well. The book will make you think that ultimately it is your work and vision which leads you to your goal, be it material or spiritual and I cannot hold myself back from referring “योगः कर्मसु कौशलम्|” phrase, which is an absolute truth. What is Best and Fine for Leisure Time? Why not be Relaxed and Happy? The author has closely followed J. Krishnamurti, and you can find references to him in this book as well. On a side note, the author already has written a book on J. Krishnamurti. When the mind has been cleansed of all that is negative, the void comes into being. Every insult shatters the ego and temporarily reduces one to a state of nothingness. Since genuine generosity comes only one is impelled by altruism, it is obviously necessary to understand the later. Altruism is the undeviating devotion to the interest of others as opposed to one’s own private interests. Man need butter and jam to go with the bread. People often make a show of their religious faith by dressing in a certain way or behaving in such a manner as to draw attention to themselves and their faith. Of what use then are pilgrimages that strengthen egos instead of eliminating them altogether? Man is still, essentially a beast at heart. For example, the modern man’s passion for violent sports like boxing is not fundamentally different from that of the acnient Romans’s desire to see Chritian martyrs being born asunder by wild animals in the Colosseum.Has the primitive nature of man not changed at all? The publisher requires an appreciation for deciding to publish such an unconventional book. Of course, a nice book to read. It is a motivational and inspirational book for those who seek the peace of mind. It is not for everyone and it is not a light read, which makes its reach limited. Around 7 out of 10.